Hiii friends!! Remember to place I had yummy Peking duck? Look at me face.. I look quite shocked..
which me didn't like it..
Mommy quite surprised to hear from Boo and Twinkle that the resort is full booked till August! rooms.. because they went quite a big family..
Finding a good and effective shampoo for my Chihuahua has been a real dread because I can't find anything that is worth sticking on. I recently bought a new shampoo which is quite pricey however it did not show any improving results on Amber's coat. Dinovite, the brand that many have talked about also provides dog shampoo ,DogOsuds , besides supplements and treats. I find that DogOsuds is a very interesting product and would love to purchase it if I saw it on counter. It says in the website that the shampoos are formulated with 100% pure and therapeutic grade essential oils that are very beneficial to your dog's coat. The shampoo could also solve Amber's flea and tick problems forever. Additionally, the shampoo does not contain chemicals, perfumes and fillers that can cause irritation and flaking to your dog's skin. As Amber does not have odor problem, it would still be nice to have Amber smell good and scented. Does your dog have problems like itching, scratching and stinking beyond belief? Products from Dinovite like DogOsuds may be the solution to your problem. DogOsuds scented shampoos are effective in eliminating bad odor and making your dog smell nice for a long time. DogOuds shampoos are easy to rinse off and lathers beautifully unlike other shampoos. DogOsuds is a product worth considering and do leave a feedback if you have tried the product on your dog. 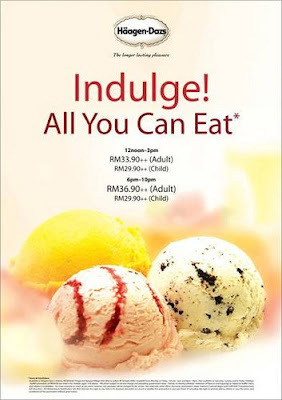 If yes indulge in all you can eat Haagen Dazs ice ream, eat as many scoops as you can! Visit Haagen Dazs branch at Solaris Mont Kiara now!